It’s a bumpy ride up to the summit of Mauna Kea and the observatories that are housed up there. Along the way, I notice signs with large round holes in them, designed thus to keep the signs from mangling and blowing over in the powerful winds that assault them at these heights. As a Canadian, I’ve seen my share of cold and wind, and I have my doubts that they can top that even at the top of a volcano when we’re travelling in paradise. But even paradise can become inhospitable. Our tour van makes rest stops during the climb, and these are geared to help us acclimate to the altitude. Buck, our tour guide from Hawaii Forest and Trail, does a wonderful job of pointing out various flora and fauna, as well as physical points of interest. As we travelled along Saddle Road, before beginning the ascent up the volcano, Buck alerted us to the presence of three different owls at three different times. I have a mystical experience when he does that, as earlier in the day, I asked for a sign from my father, who had passed away three years before. I asked him to send me an owl, which has become a sign for us of his presence. It becomes particularly poignant when Buck explains that the natives on the island consider this particular species of owl to be associated with the spirits of ancestors. Partway up the mountain, we stop to eat a hot dinner at a sheepherder outpost, sitting at tent-covered picnic tables. There are some ramshackle buildings on the property, abandoned and in disrepair, where, our guide tells us, Mark Twain and Robert Louis Stevenson supposedly stayed. We’re 6,000 feet above sea level. We’re not even halfway to the top yet. It’s cold up here, but not bitter, and there is no snow on the ground. The food and tea/coffee have done their work of warming us and fueling us up, and people explore the area around the picnic grounds, mill about chatting, or make use of the facilities before we continue our ascent up the volcano. Soon, we climb back into the van to make our way to the summit. There is one more stop on the way up, and we notice that we’re above the clouds. We’re around 9,000 feet above sea level. The landscape looks lunar. The rocky terrain looks unfriendly. I’m still wearing my sweater, though others have made use of the supplied parkas. I’m wearing layers. It’s not the hardy Canadian in me that keeps me from reaching for the parka. I’m typically always cold. We get back into the van to climb the rest of the way up. I experience a strange thrill as the observatories come into view and we reach the summit. I look up and I see clouds. I look down and I see more clouds, looking thick enough to stand on, broken only by the cold and indifferent volcanic rock. I put my parka on before exiting the van. At this time of day, tourists are not allowed to enter the observatories, and once the sun goes down and the telescopes appear, visitors have to leave. But until that time, visitors take pictures, listen to guides talk about the observatories and the various governments that own them and watch the sun go down, as slowly it begins its descent below the clouds. Sunsets viewed at ocean level on Hawai’i are spectacular, coloured by the volcanic smog or VOG, as it’s called, but the sunsets viewed from atop the Mauna Kea volcano are no less impressive. As darkness falls, we watch in rapt silence. The sun creeps down; blues and aquas turn to golds and yellows and then to black. In that moment, everything seems to pause. The spell is broken as we hear tour guides calling out to guests that the observatories will be opening their telescopes and everyone should get back into their vehicles. We have to leave. Our guide takes us down to the 9,000-foot level, to the Visitor’s Information Station, and we explore a little as Buck sets up his telescope for some stargazing. The question of the evening is whether the clouds would part enough to allow us to see the sky. They do, one piece of the sky at a time, until, by the end of the session, the sky is almost completely clear. In turn, we peek through the telescope as Buck trains it onto various celestial objects visible in the Hawaiian night sky. I have never before seen stars that were anything other than white, but Buck shows us one that is blue and one that is gold. The last item he shows us is the good old moon, and he takes our cameras for us and uses them to get a shot of the moon through the telescope. 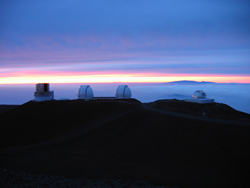 A trip to the observatories at the Summit of Mauna Kea is like stepping into another world. It feels surreal leaving the beautiful, caressing warmth of the tropical paradise down below and entering the cold, frozen lunar landscape of the top of the volcano, separated from the ground by 13,000 plus feet of rock, hardened lava and vaporous clouds. Hawai’i is a place of power, where you can feel the energy of all the elements no matter where you are on it. It is an energy that you should tap into and experience for yourself.